Been thinking for a while about a Napoleonic project, as I really enjoy the period, I don't get to play enough to be called a gamer, so just consider myself a enthusiast, with that in mind and the fact I would like to paint a wide variety of different units, but don't want many armies with hundreds of figures each I have decided to do Sharpes practice with individually mounted figures. Why not just do little dios, or individual figures you ask, to be honest, I don't know, I have always just loves painting armies as apposed to individual figures and dios. I have both 28 and 15mm figs to choose from but 15mm will keep the project small, and I'm good at this scale, whilst giving me enough work and challenge to be fun, I also have loads of figures to use, and they are cheap to buy more that I don't have. 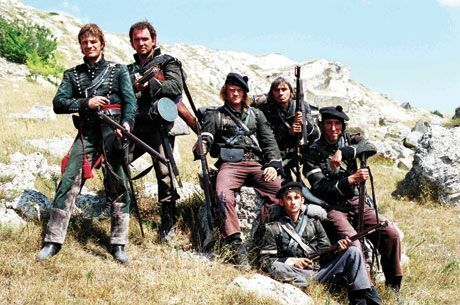 I really like the Peninsular war so will start there, but I have a shed load of Bavarians so will soon branch out as they did not serve in Spain. 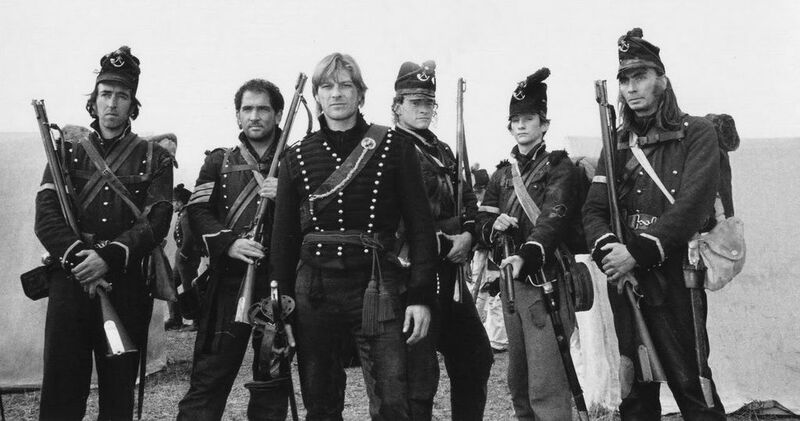 To kick off the project I will start with my favourite unit, the 95th rifles, and as I'm a fan of Richard Sharpe I will concentrate on his band of misfits, a pretty big order making them recognisable at this scale, but that's a challenge I love. So here is my Shape and Sergeant Harper characters, Sharpe looks about right, the barrel of Harpers Nock gun is way to thick, but it was the thinnest plastic rod I have, looks like he's off to kill predators in the south American jungle should I remove his hat and try to create that balding afro he has going? it may added to building his character. Last edited by Gunner Dunbar on Sat Aug 27, 2016 1:35 pm, edited 1 time in total. Here are Sharpe and his chosen men ready for undercoating, I usually undercoat black for 15mm, its very forgiving when you are speed painting and miss spots, it also allows for an easy black lining when needed, but as I am taking my time with these guys, and want the colours to pop a little I will be undercoating white. I have placed the characters on the paint stick in the order they appear in the black and white picture, Rifleman Cooper, Sergeant Patrick Harper, Richard Sharpe, Rifleman Harris, Rifleman Perkins, Daniel Hagman, as I write this I realise I have left out Isaiah Tongue, will get onto him. Rifleman Cooper - a little hard, he doesn't have much to set him apart, I made his hair a little longer and banged up his hat a little. Sergeant Patrick Harper - he gets his Nock volley gun, and Tom Jones afro. Rifleman Harris - I gave him a bonnet and he will have long curly red hair. Rifleman Perkins - another hard one, he is basically a boy, so left his hair short, just gave him a bonnet. Daniel Hagman - well long grease scruffy hair and side burns it is, oh and a banged up hat. Isaiah Tongue - when I do him I will give him a bandanna and scruffy hair. Nice effective conversions. I like Harpers gun. I think in some scales you need to exaggerate some pieces. Great start so far - I too like Harper's gun - great work on a 15mm figure!